The rugged, versatile SportHunter™ Series excels in all environments and is especially suited to multi-dog hunting situations. With the comfortable 'soft coat' transmitter finish, these units are a pleasure to use. Both the transmitter and receiver are completely waterproof and submersible. 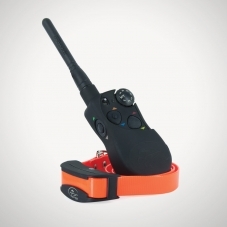 The lightweight collar receiver features a slim-profile and contoured shape that ensures a custom fit on the dog's neck. No matter what style of training you prefer, this system can provide it.